The Galway Branch of the Irish Wildlife Trust will host a special talk on corncrake conservation by Fergal Ó Cuinneagáin tomorrow Friday Dec 2 at 7pm, in the Western Hotel on Prospect Hill. Fergal Ó Cuinneagáin is a vet with a passion for wildlife conservation. His passion led him to buy a farm in the wilds of west Mayo where he has invested blood, sweat and years into developing the land in an effort to attract and conserve the rare corncrake on site. 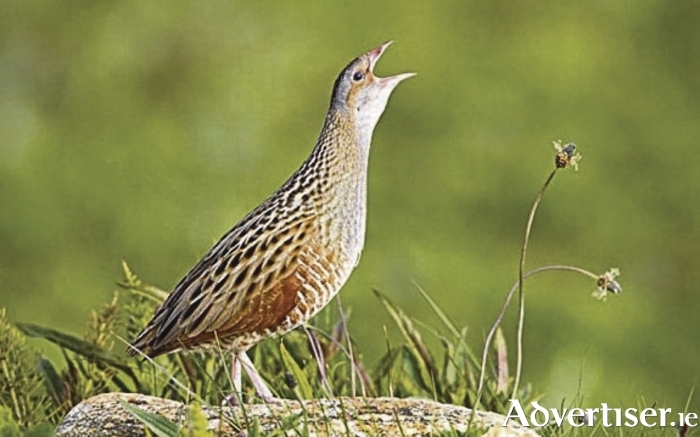 The corncrake was so common within living memory that people from all counties of the country remember its calls keeping them awake during short summer nights. The species is now an extinct breeding species in most of the country but holds on along parts of the west and north coast and western offshore islands, including islands off Connemara. The talk and Q&A will last for about two hours. This event is free of charge and all are welcome.